And me staring death in the face. 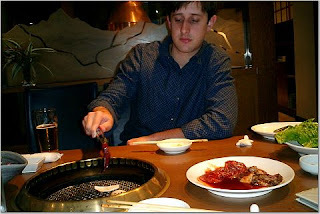 Or when Phil treated me on my birthday to a Kobe beef feast in Kobe. 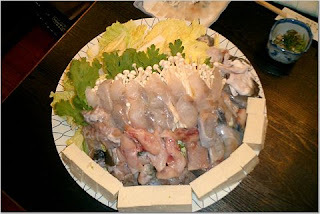 But, these experiences were rare, partly because the cost of dining out in a good restaurant in Japan is astronomical, and partly because I didn’t speak enough Japanese to confidently enter most of the better establishments (there weren’t many English menus in Kobe). I have to say that I missed crusty sourdough bread, pungent cheeses, cured sausages, deli meat, and cheesy pizza (I really must add here that many of the pizzas in Japan have a raw egg cracked in the center and a grid of mayonnaise painted on top – what’s wrong with pepperoni and cheese, people?!). 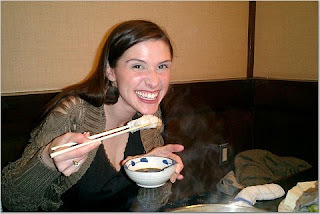 Luckily, my best friends in Japan were San Franciscans who were similarly concerned with eating well, often. 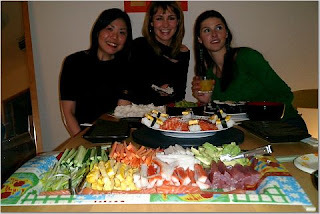 One of our favorite economical home meals was to have a roll-your-own sushi “party.” Fish was expensive, but you don’t need much of it for sushi and rice and vegetables were some of the most affordable items in the supermarket. Here are me and Katie with a bounty of raw ingredients ready to be rolled up and chowed down – oishi! Fortunately all of the ingredients for a sushi party can be found in the States, and also here in Australia (I do live in Chinatown, which actually should be called “Asia” town, so there are plenty of shops carrying Japanese ingredients a block from my apartment). In Boston, the Super 88 stores carried all the Japanese goods I could ever wish for, including some I would never wish for (natto, anyone? ), and at least two full aisles of soy sauces which will never cease to baffle me. My friend Melissa and I hosted a sushi rolling party at my apartment with some pan-Asian flair that included miso soup, homemade Shanghai soup dumplings, spring rolls, and enough sushi for our entire graduating class at BC. Since sushi leftovers are a bit fishy to say the least, we did our best to hog everything in one night. A challenge we were most certainly up for. The sushi party’s international reputation has continued in Australia, with Meagan and Amy joining me for an all-you-can-roll feast. First stop was to the Asian supermarket next door for all the tools and goodies we needed, including rolling mats, nori (toasted seaweed sheets), pickled ginger, sushi rice, wasabi and soy sauce. I worked on slicing the salmon and tuna into long, thin strips while Meagan julienned the carrots and cucumbers and sliced the avocadoes. We also poached some shrimp. Meanwhile, we made the sushi rice. You can’t use regular steamed white rice for sushi, as it will not have the correct texture and sweet flavor that makes sushi, well, sushi. Here is a basic sushi rice recipe that should work. Sometimes I also throw in a square of square of kombu (kelp) while the rice is steaming. With all of our ingredients prepared, it was time to go to work on the rolls. Meagan had never rolled sushi and I believe at this point was still a bit skeptical. She turned out to be a natural and her first rolls looked like they came straight from Nobu’s kitchen! Chef master extraordinaire Amy made an inside out roll, with the rice on the outside of the nori. She lightly coated a square of plastic wrap with nonstick spray, made an even layer of sushi rice (always use wet hands when working with sushi rice to prevent sticking), topped it with a sheet of nori and the fillings, and used the plastic wrap to coax the mass of ingredients into a long roll. Normally this takes a bit of practice but hers were perfect, of course, on the very first try. And put my dinky little rolls to shame! If you want to have your own sushi party, it helps to have a shopping list and a menu in mind before attacking the “international” section of the supermarket. Most of these items can be found at a regular supermarket, except for the sashimi-grade fish, for which you might need to visit a fishmonger. If you can’t find sashimi-grade fish, you can always used poached shrimp, imitation crab (found in the freezer section), or even smoked salmon to make Philly rolls with cream cheese. Vegetarian sushi is also an option. Have fun and here’s to Nippon-wa! small dishes for soy sauce, wasabi, etc.